Hillary Rodham Clinton said this week that, if it came to it, she would let a big bank fail — and it would not be surprising if other presidential candidates adopted her anti-bailout stance. But regulations introduced since the financial crisis of 2008 have, in theory, already made it much safer to let a bank die. And on Friday, the Federal Reserve proposed a new rule that aims to make the process of winding down a faltering financial giant smoother still. It would require banks to have a bigger financial buffer that could absorb potential losses on loans and trading positions. The new regulation seeks to inflict the costs of a failure on investors who have lent to an ailing bank and on its shareholders, rather than on taxpayers. The hope is that the rule would work without greatly disrupting the wider market and economy. 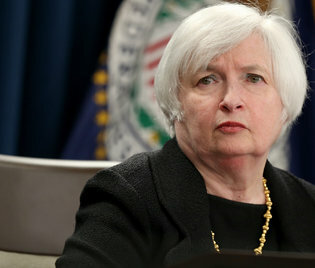 “The proposal is another important step in addressing the ‘too big to fail’ problem,” said Janet L. Yellen, the Federal Reserve chairwoman, referring to the notion that the government has to bail out big banks because letting them fail would cause severe collateral damage in the economy. Of course, there can be no guarantee that the authorities would let a large financial firm topple in a future crisis, especially if several big banks are teetering at once. In 2008, soon after Lehman Brothers collapsed and the global financial system seized up, government officials dropped their opposition to bailouts. At the very least, though, the new rule and related regulations could force investors to think harder about the risks of backing financial giants. And if large banks have to consistently pay more for their financing, they may decide to shrink to make their businesses more profitable. “The proposal should also improve market discipline,” Daniel K. Tarullo, the Fed governor who has spearheaded several new banking rules, said in a statement. The banking industry, perhaps wanting to avoid harsher measures, has mostly embraced the system of winding down large banks that was set up under the Dodd-Frank Act, which Congress passed in 2010 to overhaul the United States’ shaky financial system. Still, the Fed’s new rule, which focuses on the country’s eight largest banks, like Citigroup and JPMorgan Chase, could increase costs for an industry that has already borne the burden of hundreds of new regulations. The Fed estimated that the eight banks would currently need $120 billion combined to meet the requirements of the new rule. The banks may not need to issue large sums of additional debt and equity to make up that shortfall. Even so, the Fed estimated that the banks’ combined cost of financing themselves could increase by as much as $1.5 billion a year. The banks and others, including the public, can now submit comments on the rule. The Fed’s rule stems from an international effort to expand financial buffers at giant banks to help protect them against losses. The official name for the buffer is total loss-absorbing capacity. Most of the buffer takes the form of shareholders’ equity, the part of a bank’s financing that does not need to be paid back. The new rule stipulates that the buffer must also include a certain amount of long-term debt that the banks have issued to investors. A bank’s borrowings are not usually seen as a stable form of capital because the money has to be repaid, and thus may not be around to absorb losses if the bank’s creditors flee. But the new rule says that the debt must be long-term in nature, which means the creditors cannot demand immediate repayment. When a bank crashes and is seized by regulators, its equity often gets wiped out by losses. The innovation under the new rule is that the long-term debt in the buffer would absorb any losses left after the equity is gone. And, crucially, the debt would be turned into new equity that would provide the financial foundation for the new bank that emerges from receivership. By making it clear upfront who will bear a failing bank’s losses, the Fed hopes to dispel much of the chaos and panic that can occur when a large financial firm is foundering. Mr. Tarullo said that the rule could reduce the risk that other creditors will flee the bank. The eight banks — which also include Goldman Sachs, Morgan Stanley, State Street, Bank of New York Mellon, Bank of America and Wells Fargo — have time to raise new debt. Broadly speaking, at the start of 2019, a bank’s loss-absorbing buffer would have to be equivalent to at least 16 percent of its assets. The percentage increases to 18 percent by the start of 2022, when the rule takes full effect. But some banks will most likely end up with higher buffers. Under certain assumptions, which could change if the banks shrink or grow, JPMorgan’s buffer, for example, could reach 23.5 percent of its assets, according to figures released on Friday by the Fed. The buffer for Goldman, Morgan Stanley and Bank of America in this analysis was 20.5 percent. The big question is whether that buffer would be sufficient in a crisis. On paper, the buffers would have amply absorbed the level of losses sustained by banks in the last crisis and the subsequent recession. But the Fed noted that losses might have been higher in the last crisis had the government not shored up the system — and there may be less assistance in the next bust. Right now, six of these eight banks have shortfalls under the new rule. Fed officials declined to say which banks those were. Analysts added that it was hard to identify which banks already complied because it was not clear how much of a bank’s current long-term debt would qualify for inclusion in the buffer. Still, some banks may need to raise more new long-term debt than others. Wells Fargo, for instance, may need to issue long-term debt to replace financing it gets from other sources like deposits. Also on Friday, the Fed joined other federal regulators in approving a rule that aims to strengthen the market for swaps, a type of financial contract that is traded heavily on Wall Street. A version of this article appears in print on October 31, 2015, on page B1 of the New York edition with the headline: Fed’s New Rule Would Ease Strain From Dying Banks.